A sleepy Cornish seaside village becomes the most heavily guarded communications centre of WWII. A ruthless Nazi spy is on a mission to destroy it and change the direction of the war. Can Churchill’s special agent uncover the plot and intercept him? Can the Home Guard sergeant living there save the day? 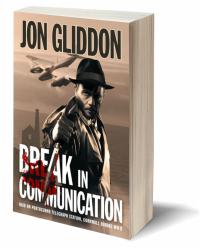 Break in Communication is a historical spy thriller, set around Porthcurno Telegraph Station. ​It is December 1941. World War II has become a truly global conflict with Japan attacking the American fleet in Pearl Harbour. The Luftwaffe are bombing English cities and the Nazis are about to launch their super battleship Tirpitz. With the tireless Winston Churchill as his boss, Colonel Julian Bonham-Johns from the Special Operations Executive is under pressure. As a ruthless foreign agent is making his way through the south west of England it becomes clear that a sinister Nazi plot is unfolding. In a bid to stay ahead of the ene​my Bonham-Johns must mastermind a plan with the Allies and intercept the agent. It’s a race against time to navigate tensions and egos while feeding lies and misinformation to the enemy. But all is not as it seems. Home Guard sergeant Bert Chenoweth hoped to live out his days in the beautiful Cornish fishing village of Porthcurno. He never reckoned on having to do battle again, but then he never reckoned on this kind of threat on his doorstep. Will he find it in himself to fight one last time for the things he holds dear? As the end game approaches, the enemies clash, head-to-head at Porthcurno Telegraph Station in a thrilling, violent and unexpected conclusion. In the early stages of WWII, with occupied France only 100 miles away, the picturesque Cornish seaside village of Porthcurno became one of the most heavily defended locations in Britain; designated Security Area 28. It was deemed so crucial, that the Porthcurno Telegraph Station was relocated in a newly constructed, high security underground facility, deep within the granite cliffs. In reality the Germans never attacked Porthcurno, but as a key strategic facility for the Allies they must have thought about it. Break in Communication imagines what might have happened. Read more here. For more about the history of Porthcurno Telegraph Station please see here.